A P-40 from the Flying Tigers. Armourers working on a Tomahawk Mk.II from No. 3 Squadron RAAF in North Africa, 23 December 1941. A Kittyhawk Mk III of No. 112 Squadron RAF, taxiing at Medenine, Tunisia, in 1943. A ground crewman on the wing is directing the pilot, whose view ahead is hindered by the aircraft's nose. 3rd Squadron Hell's Angels, Flying Tigers over China, photographed in 1942 by AVG pilot Robert T. Smith. P-40K 42-10256 in Aleutian "Tiger" markings. By mid-1943, the USAAF was superseding the P-40F (pictured); the two nearest aircraft, "White 116" and "White 111" were flown by the aces 1Lt Henry E. Matson and 1Lt Jack Bade, 44th FS, at the time part of AirSols, on Guadalcanal. Top to Bottom: P-40 F/L, P-40K Warhawk. A P-40E-1 piloted by the ace Keith "Bluey" Truscott, commander of No. 76 Squadron RAAF, taxis along Marsden Matting at Milne Bay, New Guinea in September 1942. 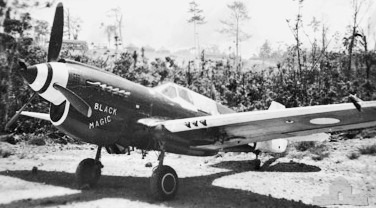 P-40N-15 "Black Magic", No. 78 Squadron RAAF F/L Denis Baker scored the RAAF's last aerial victory over New Guinea in this fighter on 10 June 1944. It was later flown by W/O Len Waters. Note the dark blue tip on the tailfin used to identify 78 Squadron. 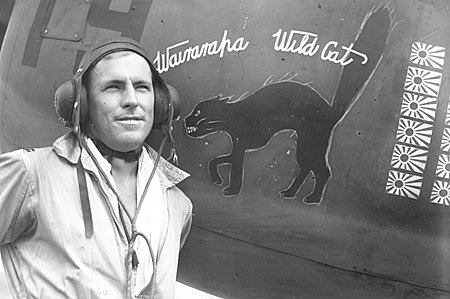 F/O Geoff Fisken in front of his P-40, Wairarapa Wildcat (NZ3072/19). Hawk 81A-3/Tomahawk IIb AK255, at the U.S. National Museum of Naval Aviation, is shown in the colors of the Flying Tigers, but never actually served with them; it began life with the RAF and was later transferred to the Soviet Union. P-40 Warhawk at Campo Dos Afonsos. A USAAF Curtiss P-40K-10-CU, serial number 42-9985, c. 1943. The Fighter Collection's P-40F G-CGZP, showing Merlin 500 engine. Curtiss P-40N Warhawk "Little Jeanne" in flight. Jackie Cochran in the cockpit of a P-40 fighter aircraft. She was head of the Women Airforce Service Pilots (WASP). The only Finnish Warhawk in 1944. This aircraft was a former Soviet P-40M (known as Silver 23). 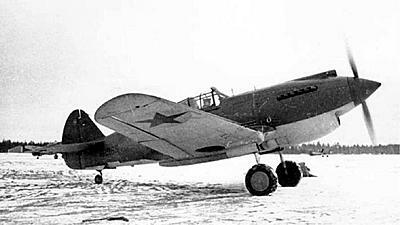 A Soviet P-40B Warhawk in 1942. Curtiss P-40 Warhawk Facts for Kids. Kiddle Encyclopedia.